The Sixty-sixth World Health Assembly, WHO’s annual global meeting of ministers and senior health officials, opened on 20 May. Addressing the delegates, Dr Margaret Chan, WHO Director-General, referred to the continuing outbreaks of novel coronavirus, now called Middle East respiratory syndrome coronavirus (MERS-CoV), and human infections with the H7N9 avian influenza virus, warning of the global threat to health posed by emerging and epidemic-prone diseases. “Going forward, we must maintain a high level of vigilance. I cannot overemphasize the importance of immediate and fully transparent reporting to WHO, and of strict adherence to your obligations set out in the International Health Regulations,” she commented. The Director-General also reflected on the success of the Millennium Development Goals, and current health challenges, including noncommunicable diseases (NCDs). Noting that industry often influences NCD risk factors, she underlined that WHO can and should work with it when appropriate. “Conflict-of-interest safeguards are in place at WHO and have recently been strengthened. WHO intends to use these safeguards stringently in its interactions with the food, beverage, and alcohol industries to find acceptable public health solutions. WHO will continue to have no interactions whatsoever with the tobacco industry,” said the Director-General. The World Health Assembly will discuss a draft global action plan on NCDs, as well as action plans on mental health and the prevention of avoidable blindness and visual impairment. Other issues on the agenda include WHO reform, progress in achieving the health-related Millennium Development Goals and the post-2015 development agenda, implementation of the International Health Regulations, a global vaccine action plan, universal health coverage and responses to shortages in and migration of the health workforce. 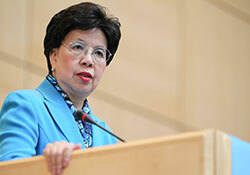 The Sixty-sixth World Health Assembly is being held in Geneva, Switzerland on 20–28 May 2013. Dr Raisa Bogatyryova, Minister of Health of Ukraine, was elected Vice-President of the Health Assembly. The delegation of the Russian Federation met with Ms Zsuzsanna Jakab, WHO Regional Director for Europe, to discuss collaboration and work to extend the dissemination of publications on health in the Russian language. The Russian Federation also organized a side event on multilingualism and presented the joint projects it is undertaking with WHO, including a revised glossary and database for Russian-language publications. The delegation from Ireland, the current holder of the Presidency of the Council of the European Union (EU), took the floor in plenary, underlining WHO’s crucial role in ensuring that health is a cornerstone of the post-2015 development agenda. Universal health care is key, and future priorities should reflect the three dimensions of sustainable economic, social and environmental development, and the need to work across sectors, according to the EU. The delegation of Germany identified universal health coverage as unfinished business that must be included in the post-2015 development agenda. During plenary discussions, the delegation from the United Kingdom emphasized the importance of addressing health challenges related to an ageing population, such as dementia, and the growing threat of antimicrobial resistance. In a plenary intervention, the Russian Federation highlighted the importance of preventing NCDs, and WHO’s role in coordinating international efforts in this area according to the global plan under discussion. With the Director-General and the delegation of Switzerland, WHO/Europe signed the first country cooperation strategy in the European Region. It focuses on four strategic areas: exchanging information on NCDs, nutrition and food policies, mental health and substance-use issues; strengthening cooperation on national health systems; supporting WHO in strengthening its leadership role in global health governance; and enhancing collaboration between WHO and the Swiss Agency for Development and Cooperation. The Minister of Health of Ukraine, Dr Raisa Bogatyryova, met with the WHO Regional Director for Europe to discuss the importance of boosting immunization in Ukraine, the success of initiatives during the 2013 European Immunization Week and Ukraine’s significant progress in addressing tuberculosis and multidrug-resistant tuberculosis. Health financing and the impact of the economic crisis on health were the focus of a bilateral meeting with Dr Paulo Moita de Macedo, Minister of Health of Portugal. The Minister thanked the Regional Director for WHO/Europe’s recent meeting in Oslo, Norway, on health systems in times of global economic crisis, and she offered further assistance on this issue. Discussions with the Minister of Health of Greece, Mr Andreas Lykourentzos, focused on the importance of adopting the revised EU directive on tobacco products.